I was diagnosed with scoliosis at the age of 12. A doctor who is specialised in a stomach problems send me to a stomach X-ray. He noticed that there is a curve in my spine. He asked me if I did stand straight. I wasn�t really sure what to say, because I was quite young, so I thought that I didn�t stand straight. At the end the doctor advised us to go to a spine specialist doctor to make sure everything is alright. We didn�t take it serious and we walked out and forget about it because really there was no sign on me shows that I have spinal deformity. My posture was normal and had no pain at all. (lumbar scoliosis). He told to me about my back problem, but he had no solution for it at all. The doctor said to me that he will keep on eye on me and do observations every 6 months, just to make sure that is not getting worse. Also, I was informed by the doctor that they can not do a surgery because my curvature is not that big, and advised me to take pain killer when needed. After that my problem was getting worsen and even effected me with my studies. I had to be away from school for a while because of the pain I had. Then I went again to my GP who referred me to a physiotherapy. I had a several sessions of physiotherapy with no result. I still had a back pain. I suffered all these years and tried to find a solution for this. I have been to many doctors, but sadly none of them helped. My problem was getting worsen day after day. Suddenly last year I started getting problem with my posture with limited movement. I got so stiff and not able to do normal physical movements. Even my curvature increased. I have been back to the GP. The doctor again told me that they can not do anything. I was leaning forward, more and more, and my posture was awful for a 20 years old girl. I didn�t know what to do. My family, specially my mom, was suffering a lot with me. She tried to find a solution, which can help me. 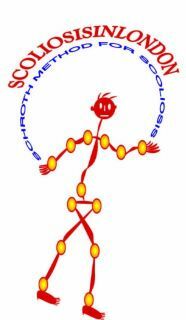 I used to sit in front of the internet for many hours to find any possible solutions for scoliosis. 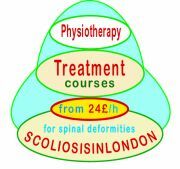 I found SCOLIOSISINLONDON centre, which I am going to at the moment. This is a special exercise based treatment designed for people with spine deformity. I have made an appointment with the consultant Joanna. On a consultation she explained to me everything about the spine and my problem. She told me that I need an intensive treatment course, 5 hours of exercise everyday to increase my flexibility and my posture. Also, Joanna told me that after the treatment I have to keep doing these exercise to keep my result. When I started the course it felt so hard. But at the same time it was so entertaining. I was feeling so happy of me doing exercises, actually the right exercises for my spine, which can help me to correct my posture and increase flexibility. Working with Joanna was so nice. She is a nice lady. I had so much fun and pain at the same time. The pain was muscles pain, but it was good because I knew that the muscles started to work and that�s why I am getting the pain. My posture started to get better and I looked straighter. My movement and flexibility increased from the day I started until now. So it was a good job. Hopefully before I leave I will be proper flexible and my posture will be straight. Early detection may lead to early treatment,which may stop the curve from getting worse.